Why trail running adventure tour is very popular? Trail running adventure tour is very popular for young age people in Nepal. Our trail running adventure tours are designed for active adults and offer a well-paced mix of walks for fitness at all levels. Most of the trail running adventure holiday is moderate to strenuous difficulty. There is an often shorter trail, easy-adventure in some destinations. Furthermore, Nepal is perfect land for you if you are a trail running lover. Every year, we arrange trail running trips in Nepal in different seasons. So, you are welcome to join us for once in lifetime trail running experience. 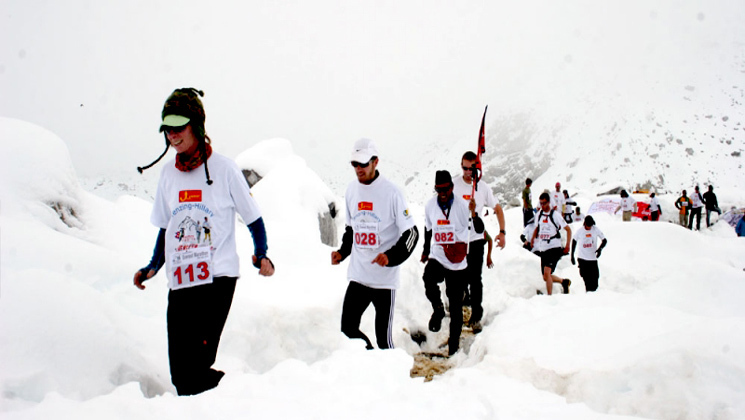 Some of the popular trail running adventures are Mount Everest trail running adventure held on May 29. Likewise, Manaslu trail race happens at the beginning of November. Mustang trail race happens in 14-27 April 2019. Finally, Lumbini Peace Marathon (21 kilometers) happens 1st of March every year. Besides that, Gokyo Treks and adventure company owned by local guides and register in 2005 under the law of Nepal Government. It’s a trusted and certified trail running adventure operator agency makes your holidays better. The best walking holidays operator company committed the best service at a reasonable price. Through the mystical Himalayas which has 8 of the world’s 10 highest peaks. We provide outstanding excursions such as Annapurna, Mustang, Langtang, Manaslu, Everest and more walking holidays on request. Nepal trek operator makes your walking holidays more enjoyable within the lowest price. We arrange small to the big group as upon the suggestions. Moreover, we also arrange an adventurous hiking , trek, jungle safari, peak climbing, wilderness expeditions trek, family tour adventures, group holidays with professional service. Your satisfaction is our goal and thus we are always conscious to make your holiday the most memorable lifetime experience. Take a review about trail running tours in Tripadvisor.